War and Filmmaking: John Boorman, Declan Power and Sean Rocks in Conversation at DBF2016. We sit on wooden benches on the Friday evening of Dublin Book Festival, the audience clustered together, waiting in anticipation for the discussion on war and filmmaking to begin. A restored old stone wall with beautiful arched windows towers over us in Smock Alley Theatre’s most atmospheric venue, The Boys’ School, adding to the intimate tone of the event. 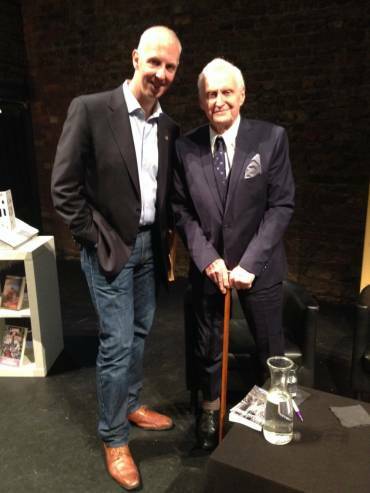 The audience looks ahead to where there are three empty chairs set up; these chairs are to accommodate film director and novelist John Boorman (Deliverance, Hope and Glory), military man turned nonfiction writer Declan Power (Siege at Jadotville) and RTE Radio 1 Arena presenter Sean Rocks as they discuss the common ground between Power and Boorman’s respective expertise. On the cards for this conversation are the themes of Power and Boorman’s books; Power’s account of military history which features A Company’s bravery in Katanga in 1961, and Boorman’s newly released novel on the process behind filmmaking, Crime of Passion. Such diverse topics as creativity, expression, originality, commercialism, emotion, and the nature of reality surface during this scintillating conversation, while unlikely similarities between the polarised disciplines of war and film production come to light. Sean Rocks’ questions are thoughtful and their progression is well structured, ensuring an interesting conversation between the three parties. There is an intent behind the questioning: Rocks wants to understand not only the unusual similarities between filmmaking and war but to investigate the “ongoing battle between money and art.” The conversation ends up so stimulating that Rocks, dedicated to seeing this discussion through to its conclusion, suggests extending it when all of the questions haven’t been addressed by the original finishing time. Commencing the conversation, Rocks visits his idea that “making a film and making war are actually a lot more alike than we might think.” Confirming this, Boorman describes the process of making a film in drastic terms: “You wage war to get it made”. He takes this one step further with a bold, inflammatory assertion — “Being in the army is not nearly as tough as making a film”. From different lips and taken out of context, such a statement may seem controversial. However, Boorman has experiences of both polarised worlds, of war and filmmaking. His time as a conscript in the army in the 50s served as inspiration for his last film Queen of Country. His age combined with this dual experience give him an arguably unique vantage point for making such comparisons. 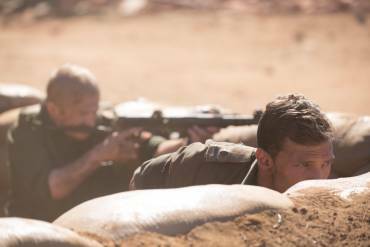 Power, whose Siege at Jadotville has recently been adapted to film by Netflix also sees similarities between war and filmmaking. Though lightheartedly pointing to the glaring inconsistency that “nobody should be killed in the making of a film” he concedes the responsibility “falls on one man or woman’s shoulders, that is, the director”. Power uses military terms to describe the filmmaking process, speaking of the logistics of coordinating manpower, paraphernalia, costumes. Boorman entertains the audience with tales of Old Hollywood and a life in showbusiness, dropping such names as Tony Curtis and Quentin Tarantino with an admirably casual air. One of the most interesting aspects of his reflections on filmmaking, however, is his dog analogy. This metaphor refers to “the marketing tail wagging the artistic dog”: the notion that the commercial motivations of a filmmaking venture decide upon whether or not the film will do well, or even be made in the first place. Originality, Boorman asserts, becomes the enemy in the film industry today. Rocks establishes a parallel by suggesting the metaphor of the political tail wagging the military dog in order to underline the issues described in Power’s book and many other military operations. Just as marketing dictates what happens in the film industry today, politics were instrumental in the events which took place in the Congo in 1961 and what happened to the Irish A Company at Jadotville. “The troops were deployed to protect the townspeople of Jadotville: that was their military objective…Nobody had put in place a plan to support them logistically or militarily. There wasn’t a whole lot of thought put into it. There were numerous comments throughout the discussion that these true events at Jadotville could easily have formed the basis of a fictional film, the large number of 3,000 adversary forces fended off by only 300 Irish soldiers, all of whom survived. Power lightheartedly remembers Jadotville director Richie Smyth joking about how if he brought the story to Hollywood, the film would end up about American soldiers fighting a completely different battle elsewhere. Power mentions on more than one occasion during the talk that A Company’s story was one about which nobody in Ireland wanted to know, making the success of Power’s book and the subsequent Netflix adaptation all the more poignant. Much of the film’s impact lies in its ability to place the viewer in the thick of the action. Jadotville director Smyth captured certain scenes from the soldiers’ perspective to such an extent that Rocks wonders whether or not it truly happened along those lines. Boorman thinks of filmmaking as an “emotional business.” How accurate then, is the depiction of the siege and the specific tactics employed in the film? Power celebrates Smyth for having taken “a personal interest” and telling “the essence of the story.” Though evidently certain aspects had to be dramatized, Boorman gives us his outsider’s perspective; he remarks that the real siege of 1961 already resembled “a movie where the cameras weren’t present”. The question of what is real and what is simulated is pertinent when Los Angeles stands as the filmmaking hub of the Western world. LA’s reputation is of their people living no more authentically than the films they make. With Boorman commenting on this issue in Crime of Passion and Power’s true account of Siege at Jadotville having been adapted into a film featuring a brave Kerryman as a protagonist, we must be thankful for the artists in our midst who take pride in sharing their unique and very real insights with the world. Blog copy by Helena Goode and Julia McConway.